Slingshot Scenes: 10 Must-Hear Songs From Philadelphia From poignant narratives to vivid vignettes, emotional soliloquies to incensed rants, Philadelphia's songwriters reflect on what it means to be a real-life emotional human being in the late 2010s. American Trappist (left), Soul Glo (middle) and Kayleigh Goldsworthy bring captivating emotional perspectives to their songwriting. The best songwriters are often deep thinkers, and Philadelphia's current crop of voices is no exception. In poignant narratives and vivid vignettes, emotional soliloquies and incensed rants, Philadelphian artists offer perspectives that reflect on not only what it means to be a Philadelphian, or an American, but a real-life emotional human being in the late 2010s. Here are 10 must-hear songs that capture that feeling in styles that run the gamut from Americana and folk to rap and avant-garde rock. "Nobody's Gonna Get My Soul"
After ending his '80s rock band River City Extension and moving from Tom's River, N.J. to Philadelphia, singer-songwriter Joe Michelini entered the first period of his adult life completely removed from the church that was his upbringing. He rethought ideas he'd been taught all his life; he fixated on mortality and experienced fits of dread and depression. Michelini's new project, American Trappist, documents that existential journey in rousing rock anthems on last year's Tentanda Via. The album is a musical memento mori of sorts, and comes to a head on "Nobody's Gonna Get My Soul," where punchy Hold Steady-esque guitar riffage and bright Stax-style horns bring the songwriter to a resolution. Simply put, we don't know what the great beyond holds for any of us – "Every day I'm getting old / But I don't need a reason, or something to believe in" – and in that realization is a peace that's liberating. Contemplative singer-songwriter Rachel Andie explores time, memory and various facets of interpersonal connection on her second full-length album, Tu Me Manques (French for "I Miss You"), released in late 2018. After a difficult adolescence – she dropped out of high school at 15 and worked in the service industry to support herself, all while living with bipolar depression – Andie went on to become a music educator, and today her nonprofit brings music instruction to various underserved schools in Philly. With her band The Fifth Element, she recorded an album that meditates on love, distance, independence and personal growth, and the dreamlike "Waves" touches on a duality of emotion and identity. Andie sings in English and Japanese in tribute to her mother, and though some lyrics seem to describe a fading past, posing the question "Do you not remember anymore?" in Japanese, the English refrain describes a permanent connection, despite barriers: "Forever in the tide / You and I collide / Oh, porous is my mind." Alternative R&B singer-songwriter and poet Christinna O draws inspiration from artists like Aaliyah and Frank Ocean as much as early 80's punk and emo, and you hear both in her incredibly catchy single "Lay It Down," released this February. The hook bops and grooves in a suave sway, but it's just as easy to imagine the melody being belted in a My Chemical Romance or Fall Out Boy kind of style. Like those bands, Christinna O uses lyrics that are very specific and situational – in this case, a look at the moment where a couple realizes the way through an impasse is by lowering their defenses and putting it all out on the table. "I trust you — I need you to say it all again. / Can we lay it all out now? Just ask me again." "My favorite bar is my personal hell," Kate Breish sings on this loving but completely exasperated tribute to storied South Philly dive Ray's Happy Birthday Bar. Picture this: It's been a long day at work, you just want to meet your friends and unwind with a PBR and a shot of Jim Beam, and a creepy dude at the next barstool will not leave you the heck alone. Breish's band Full Bush excels at punk rock jams that are observational and honest, but also tremendously funny. And though there's nothing enjoyable about this common scenario of being trapped in conversation with some toxic dude, by the end of "Ray's" you, too, will be screaming along in cathartic delight. A veteran touring musician on the folk/punk circuit, Kayleigh Goldsworthy is a fast-moving soul who lived in close to a dozen other cities before landing in Philadelphia in 2017. Such transience aligns with certain personality traits — independence and strength on the one hand, perhaps a slight fear of emotional connection on the other — and her song "Jamie" from last year's wonderful All These Miles EP addresses both sides of that divide. Using a turbulence-filled plane ride as the central image that sends our narrator into deep introspection, we hear their reflections about old friends who get married to strangers, about the places they've lived, and a lack of geographic stability. In a way, it's a sad song about a nomad resigned to their fate. But it also speaks to how we can adjust and adapt, find our path, offer forgiveness to people who drifted on their own way and hope for continued connection throughout it all. "At the bar where you literally saved me from fatal heartbreak"
Philadelphia six-piece Hour is an ensemble that can say quite a lot with no words at all. Led by guitarist Michael Cormier and featuring members of his minimalist folk band Friendship, as well as singer-songwriter Abi Reimold, the band's Anemone Red LP (released last year on Lily Tapes and Discs) stages cinematic scenes that swell and quietly soar in the spirit of indie instrumentalists Dirty Three, The Album Leaf and American Analog Set. The album's sonic centerpiece was named after a text message Cormier received from a friend who was grabbing a drink at Callowhill pub The Institute: "Where are you?" "At the bar where you literally saved me from fatal heartbreak." As Cormier tells it, the "bright neon-red sign and dimly lit interior make for a good backdrop to console someone experiencing a turbulent and fluctuating relationship," and as the song builds and blooms with strains of keyboard, viola and pattering muted drums, that feeling of comfort and companionship is palpable. There's no single path to follow in the wake of personal trauma, but as Ivy Sole sees it, moments of weakness will ultimately lead to strength over time. This poppy yet emotionally riveting cut from the Philly rapper's 2018 album Overgrown opens on an image of childhood prayer that immediately gets cut down by a harrowing account of sexual assault, secrecy and shame. And as the song unfolds, emotions of fear and mistrust give way to growth: "See, I've been looking for God in everywhere but my head / And I've been looking for peace in every place but my heart / And I searched high and low, near and far / But the time and the distance are what made the wounds depart." Ivy Sole is an MC with a surplus of empathy, something we saw on the two self-released EPs leading up to Overgrown, and as much as the project addresses mental health struggles and the lows of life, she also shines a light on ways to overcome them by learning to love yourself. Otherworldly synthesizer textures and head-spinning guitar licks are a staple of Philadelphia indie trio Lizdelise, but so are hooks. In the spirit of St. Vincent, the band bridges experimental and widely accessible approaches to rock songwriting, and on their February LP Holy Matrimony, that's best exemplified by the tremendously poppy "Boy." The song finds bandleader Elizabeth DeLise in a moment of emotional entanglement: identifying with a young boy in an airport lobby, indecisively torn between cold and distant parents, and in tears over his situation. As the beats drive and the licks scream, DeLise wishes for the aid of perspective and self-awareness, something she knows will only come with time. In the meantime, her plight is summarized in an indelible repeated refrain: "I was the boy, I couldn't turn and walk away / I was the boy, I couldn't ask you to stay." Veteran Philly rapper Reef the Lost Cauze has never been one to hold back in his lyricism, and past projects have seen him delivering propulsive, provocative rhymes with an aggressive action-movie kind of edge. But his latest album, The Majestic, reveals the man behind the curtain (or behind the mic), showing Reef not only as a lyrical badass but a sensitive and loving parent, and a caring person who is enraged with the state of the world. In that spirit, the track "This is Us" opens with a not-so-subtle dig at the Trump administration's immigration policy — "I heard we out here building walls now / My mama raised me to tear walls down" — and as its lively groove rolls across three minutes and change, the cut takes on bigotry, homophobia and other sorts of intolerance that crop up all over America. The solution Reef sees is unity among those who stand in opposition: "If you hate hate / Yeah, we on the same s***." Few punk bands in Philadelphia (or, if we're being honest, anywhere) convey the anger and anguish of oppression quite like Philadelphia's Soul Glo. From their self-titled debut, released on local imprint SRA Records in 2017, to their ever-changing live show, the band wields roaring riffs, feverish beats and brutal noise to viscerally address bigger-picture issues of systemic racism all the way down to more commonplace microaggressions that black and brown people endure daily. While the band continues to work on its sophomore LP, Soul Glo released a tour single last fall called "Mathed Up" that finds vocalist Pierce Jordan covering a tremendous amount of topical territory in two minutes. The plight of those pushed to the margins of society appears in lyrical vignettes about being "wrung out in the widening wealth gap," while Jordan takes down drug laws and aggressive law enforcement with equal furor. 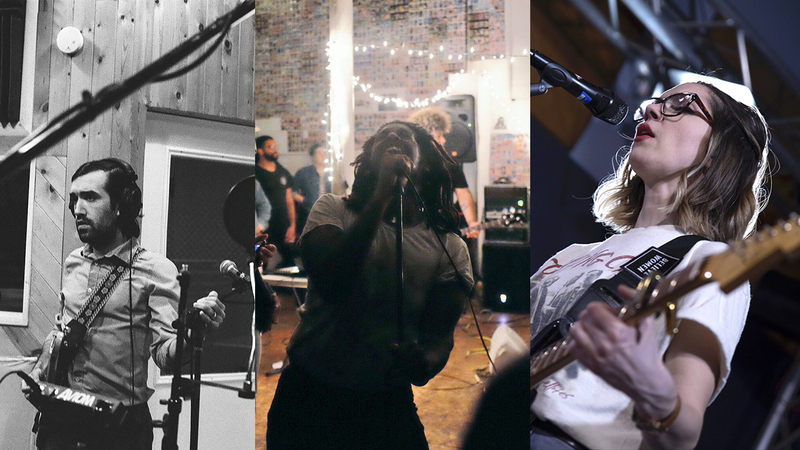 For more of this month's Slingshot Scenes, check out 10 Artists You Should Know From Philadelphia and 10 Must-Watch Music Videos From Philadelphia. All songs are currently available to stream on NPR Music's Slingshot playlist on Spotify and Apple Music.